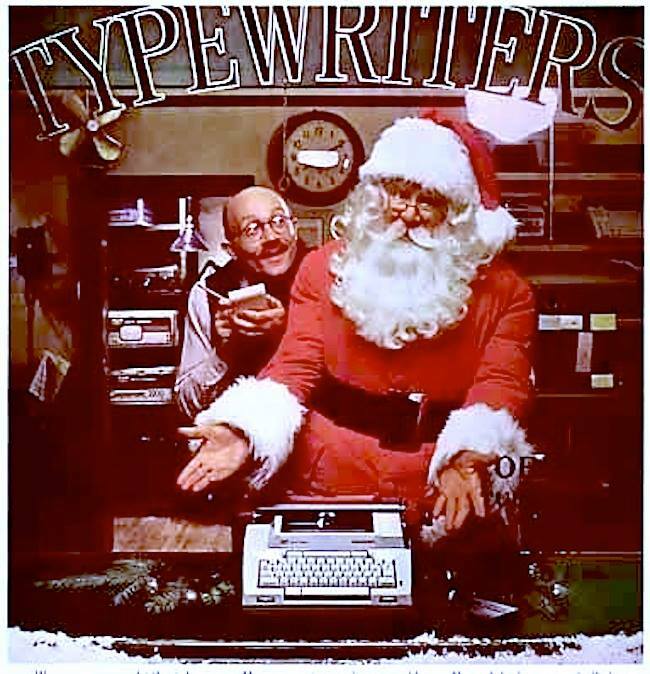 Zine (/ˈziːn/ ZEEN; an abbreviation of fanzine, or magazine) a small circulation self-published work of original or appropriated texts and images usually reproduced via photocopier. 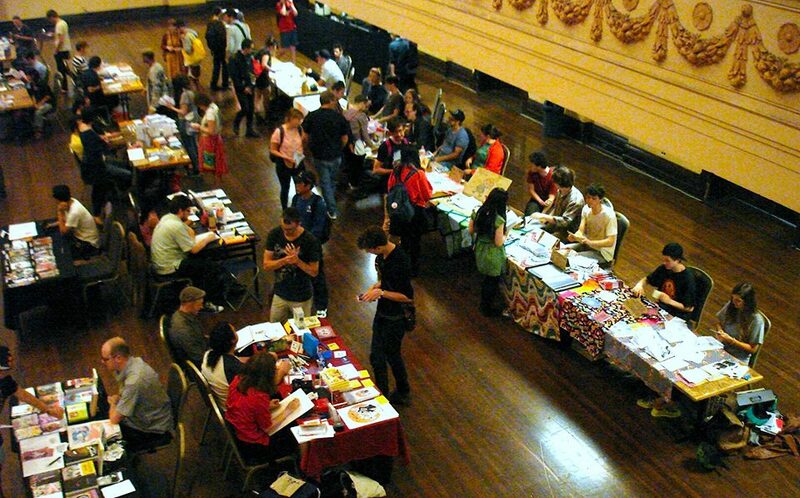 The Other Worlds Zine Fair is an alternative to the MCA Zine Fair, consisting of over 65 zine makers and distributors and filling over 50 tables. The MCA is sponsored by Transfield, a corporation that operates service contracts in the detention centres on Manus Island and Nauru. Over 65 zine makers and distributors from Australia have decided to boycott the MCA Zine Fair in 2014 and to provide an alternative event on the same day. The Other Worlds Zine Fair will be held at Level 3, Central Park Retail, 28 Broadway on 25 May, 2014 (Opposite UTS). It will run from 11am to 4pm. 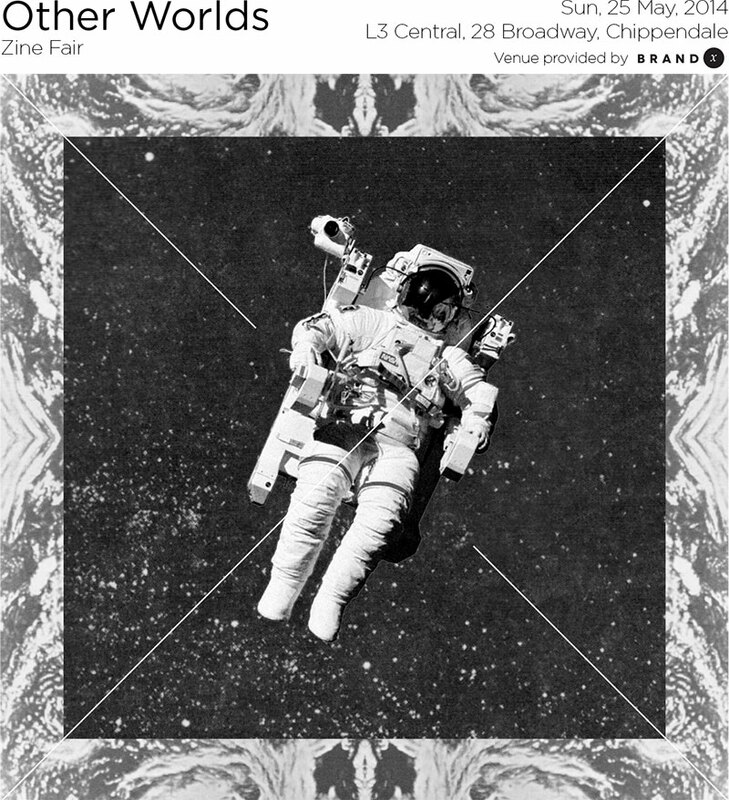 The organisers of the event believe an alternative fair will give zinesters an opportunity to show their protest while still enabling them to sell and swap their zines. It is also a demonstration that the zine community can organise their own event, on their own terms – ones that explicitly reject association with the detention industry. It is also hoped that Other Worlds will provide a space in which to initiate discussions and raise awareness of how the system of mandatory detention manifests in our everyday lives – how we are all implicated in it, how else we can resist it, and how we can help end it. RAP are a group that have produced a series of zines that display the artwork, stories and poetry of refugees and asylum seekers in the Villawood Detention Centre. These include short comics about the day-to-day experiences and trials of life in indefinite detention. The Rizzeria is collective of Sydney-based publishers and print makers. The group own an RP3700 stencil press which is available for public use through open-print sessions, and holds workshops. In addition to the zinemakers there will also be a zine vending machine provided by the Canberra Zine Emporium, as well as the Counter-Revolution crew who will be selling vegan Mexican salad rolls (and a gluten free option). I just made a graphic for the Other World’s Zine Fair. If you’d like a stall fill out this form. I’ve copied and pasted the text from our flyer so you know what we’re about. The Other Worlds Zine Fair is an alternative to the MCA Zine Fair. The MCA is sponsored by Transfield, a corporation that operates service contracts in the detention centres on Manus Island and Nauru. 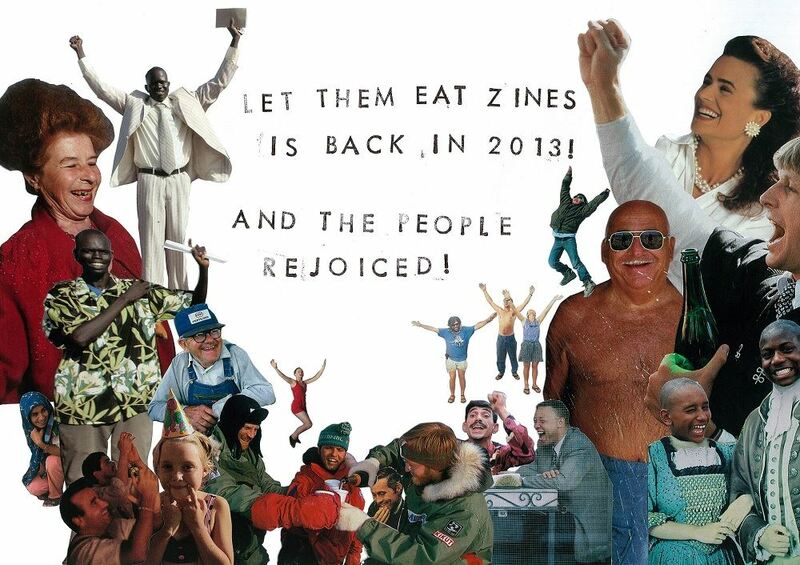 We, a small group of zine makers from Sydney, have decided to boycott the MCA zine fair in 2014. Instead, we want to hold our own zine fair: the Other Worlds Zine Fair. We’ll be holding it on the same day as the MCA’s. L3 Central, 28 Broadway, Sydney. Please register your interest by March 25 by filling out this form. Half table: $5 / Full table: $10 (tables are 1.8 metres long). An invitation to participate in an alternative to the MCA zine fair! We’re organising an alternative to the MCA zine fair and want you to be involved! The MCA is sponsored by Transfield, a corporation that operates service contracts in the detention centres on Manus Island and Nauru. Transfield derives brand value through its association with the arts, and it derives considerable profit from the extra-judicial incarceration of asylum seekers. By participating in events that are sponsored by Transfield we add value to their brand. We, a small group of zine makers from Sydney, inspired by the current campaign to boycott the Sydney Biennale over its relationship with Transfield, have decided to boycott the MCA zine fair in 2014. We do not want our zines to add value to a corporation that profits from the Australian government’s indefensible treatment of asylum seekers. Instead, we want to hold our own zine fair: the Other Worlds Zine Fair. Other Worlds will be held on the same day as the MCA fair, 25 May 2014. An alternative fair will give zinesters an opportunity to show their protest while still enabling them to sell and swap their zines. We want to demonstrate that we can make our own event, on our own terms: ones that explicitly reject association with the detention industry. We also hope to create a space in which to initiate discussions and raise awareness of how the system of mandatory detention manifests in our everyday lives: how we are implicated in it, how else we can resist it, and how we can end it. An alternative to the MCA zine fair may seem like a small protest, but it’s a specific protest that we can make as zine makers, in solidarity with asylum seekers who protest against and resist mandatory detention from within the camps. So, register your interest in having a table! Please fill in this form by March 25. Venue and details to be confirmed when we have a better idea of numbers! 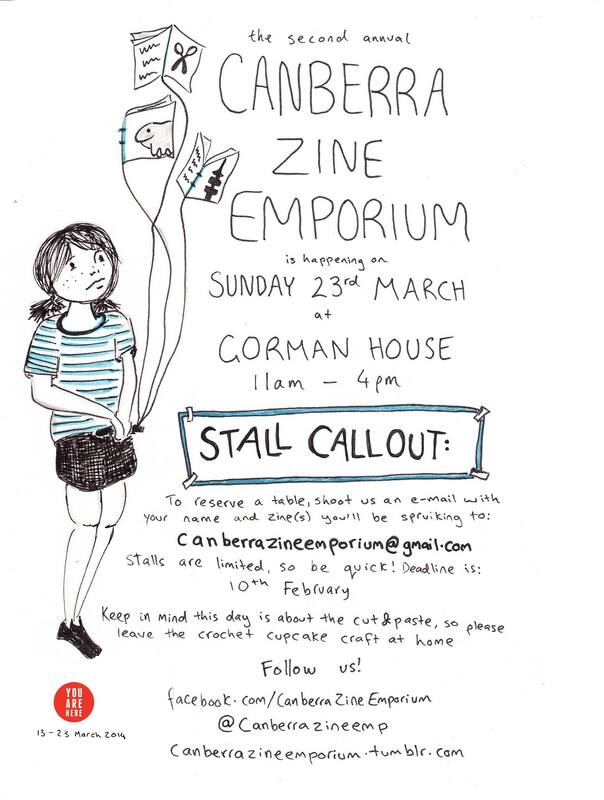 The Canberra Zine Emporium is happening on Sunday March 23 and they’re looking for stall holders! Check out the flyer above. We’re lazy so probably won’t have a table but we’ll be there to check out the other stalls. Peace! Melbourne’s Sticky is having its annual zine fair in February and are looking for zine stall applications. The fair is happening at the MELBOURNE TOWN HALL on SUNDAY 9TH FEBRUARY from 12-5pm. email downstairs@stickyinstitute.com with your name and the zine(s)/distro you’ll be representing, with the email subject ‘ZINE STALLOUT’ – it’s like a cross between zine stall and callout, see. 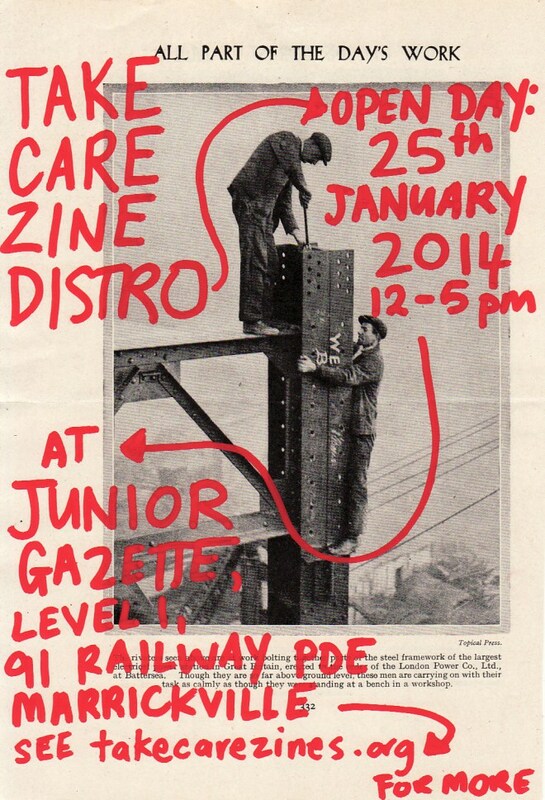 Take Care Zine Distro are having another open day, this time on Jan 25, 12 – 5pm. Last time I went we got a cup of tea and I picked up a King Cat comic! If you have any zines (created by you or otherwise) please consider donating to Sticky’s Philippines Typhoon Relief. On FRIDAY 20th DECEMBER at 6-7PM, Sticky will be having a second-hand zine sale with all $$$ going to the Philippines typhoon disaster relief effort. So if you have zines to donate bring them along and if not bring some coins and pick up some second hand zines yourself. If you want to buy us a Xmas present please follow these links. Anything from these lists will make us very happy. Last Sunday the awesome peeps at Aunt Mabel’s Zine Distro put on the Let Them Eat Zines fair in Perth. To read some interviews with the stall holders check out their Stallholder Spotlight post. Zineology from Samuel Graham on Vimeo. A few years ago Samuel Graham directed a mini-doco on the Melbourne zine culture at the time, filmed at the awesome Sticky Institute, right near Flinders St Station. Definitely an entertaining 13 minutes.